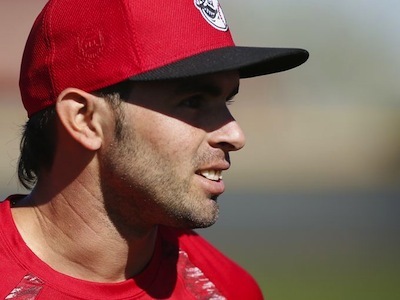 Should the Reds call up Jose Peraza? Last night, Brandon Phillips was hit on his hand by a pitch. X-rays were negative (that’s good). Earlier in that at bat, he hit two foul balls onto his leg. The Reds have not said whether Phillips will be sidelined for either of these issues for any length of time or if he will go on the DL. Some have raised the possibility of calling up Jose Peraza. Peraza was the headline return from the Todd Frazier trade this off-season. He has been playing shortstop and batting leadoff for the AAA Louisville Bats. Peraza could certainly fill in for Phillips at 2B. The downside of calling Peraza up right now is service time. Before coming to the Reds, Peraza was with a major league club (Dodgers) for 42 days. So his service time stands at 0.042. One year of service time is 172 days (0.172). To avoid using up a year of team control, the Reds must keep Peraza’s time with the major league club this year below 130 days. In other words, if Peraza earns fewer than 130 service time days with the Reds in 2016 the Reds will control him through the 2022 season. If Peraza earns 130 days or more in 2016 and then stays in the majors for the rest of his career, he would become a free agent before the 2022 season. Assuming once Peraza is promoted, he’ll stay up, to keep him below 130 days of service time, the Reds need to delay his call-up until the last week of May. Or, they could call Peraza up now for a while – hypothetically, the 15 days while Phillips goes on the DL – and then send him back down to AAA. The number of days he spends with the Reds now would push back his permanent promotion date that many days. So if Peraza comes up now for 15 days, the Reds would need to wait until mid-June to call him for good. Of course, all this assumes that Phillips will miss a significant length of time. I’d call him up. For three reasons and one thought of the future. 1. If Phillips is out (or should be out), the Reds need someone capable at second for a while. Not just a body, someone who can be expected to contribute. That’s Peraza. 2. 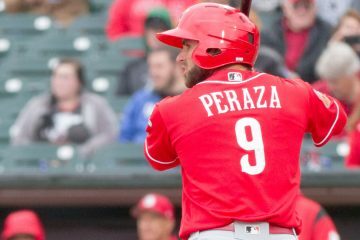 Sooner or later the Reds will want to find out if Peraza is a serious major leaguer or just a nice prospect who eventually turns into a role player or bench guy. That’s what a rebuild / reboot is for. No better time for that than when he’s actually needed. 3. I expect Phillips will be back to reclaim 2nd eventually. When he is, send Peraza back to AAA for that key month. As to the future, I’m not convinced that Peraza is a future stud. The Reds 2nd baseman in five years is at least as likely to be another player currently learning the pro game in the low minors or someone they haven’t drafted or traded for yet. If that’s the case the service time question isn’t as critical. Bottom line, if Phillips is really out for a while, it’s time to bring Peraza to Cincinnati. Yes! Bring him up for about 4 weeks and see what he has. He can always go back down. Bring him up to be in the golden (glove) triangle of SS-2B-CF. BP is no spring chicken anymore. Give him some days off to heal up. Once BP is fine let Peraza spell BP, Cozart and BHam and he can get plenty of AB’s. If they send Schebler down for Peraza to come up, Peraza can get a few more AB’s in LF. Schebler needs some everyday AB’s at Louisville. The Reds offense could use a spark and some baserunners now that Joey Votto looks to be getting out of his funk. Let the party of BHam (batting 9)>Peraza (1)>Suarez (2)>Votto (3)>and Bruce (4) see what they can generate over a 4 week span. YES. I’d DL BP for two weeks, call up Peraza and then send him back down. He plays every day while up and then every day when he returns to AAA. I think putting BP on the DL may be jumping the gun. If it’s expected that he’s going to be out more than a week then I’d say go ahead and DL him. Teams play short quite often when they have a player, especially one of their better players, who is expected to only miss a short amount of time. They don’t DL him and have him miss 12 games when not DL-ing him means he misses 5 games. Playing short isn’t exclusive to the Reds. If BP needs to go on the DL or if you can figure out someone else to go on the DL or to AAA, then perhaps you bring up Peraza. That would be assuming you can find a spot for him to play every day. There are a couple risks though that make it a little less cut and dry than simply bringing him up for 2 weeks and then sending him back down again. If he takes off and plays well, it will be hard to send him back down unless he isn’t going to play every day. Also, if someone else gets hurt, particularly Cozart or Hamilton, that could mean an extended stay in Cincy; especially if he’s playing well. Lastly, Peraza may get injured and accrue service time while on the MLB DL. So, if it’s me, I may not use Paraza quite yet. I’m not the guy who gets paid to make these decisions though and I’m sure that the Reds will weigh the service time implications against other considerations when deciding. I like the idea of bringing Peraza up and sending Schebler down for a while. Schebler is looking overmatched (admittedly he’s been facing tough pitching) and could use time at AAA. Peraza could play a few games at 2B, spell Hamilton in CF and Cozart at SS. Could always give him a start or two in LF. Then send him back down so they don’t lose the year of service time. Although if BP isn’t hurt in any meaningful way at all, it might be hard to find regular playing time for Peraza. This plan works best if BP should sit out for a handful of games. Just took a quick look and there are 4 night/ day turnarounds between thru 15 May. That would make for 4 easy starts for Cozart over the period. Also, given his track history, Hamilton would like need a day or two (at least) over the period. I agree Steve. Schebler just doesn’t have it right now. Always down 0-2. You can tell he has some power but he’s overmatched. Good post. Is it the case that, if Peraza gets injured while on the major league roster, he stays on the roster accumulating service days until he recovers? Yep, would keep accumulating service time until comes off DL. I see two risks to bringing Peraza up now. The first is that he would himself be injured and end up on the MLB DL for a long enough period of time to assure he makes a full service year by the end of this season. The second is that he would play so well that it would cause a major PR stink to send him back down, especially if the pitching stabilizes and the team is winning a fair share of its games. This said, I believe they need to bring somebody up; and, who else is there but Peraza? I agree with Ohio Jim, just too many risks right now in a lost season. We are only talking about a month when the Reds can bring him up and not worry about the 130 days of service time. June though September is enough time to see what he can do at the major league level. Just think where we might be or the prospects we might have gotten, if Mike Leake had been held back enough time to get another year before he hit free agency. Stick to the plan. The only way they should bring Peraza up in my opinion is if they need to DL Phillips. If you bring him up and send Schebler down, you run the risk of not being able to send Peraza back down if he a) tears it up in the big leagues or b) Schebler continues to struggle in AAA or c) another position player gets hurt where he can bet starts at: SS, CF, etc. Keep him down there until the end of May to ensure we can have an extra year of control and then if he still is tearing it up in AAA like he has to this point, bring him up. No, they should wait to call him up. His walk rate is up this year, and his strikeout rate is down, which suggests that he is starting to get deeper into counts than he had in the past. (It being impossible to walk or strike out on 2-pitch ABs.) He needs to learn how to hit deeper into counts, before coming to MLB, and not have to learn on the fly against the best pitchers in the world. That is the purpose of the minor leagues–to teach and develop. He won’t be 22 until later this week, and in the long run the Reds and Peraza will both be better off if he hones his offensive skills–here, his patience–while still in the minors. I misstated that, as his strikeout and walk rate are both up, which suggests he is seeing more pitches. Phillips lets minor injuries linger into weeks. Put him on the DL. He plays hard but enjoys that bench. Seems like Ivan can fill in adequately without any recalls. Every small market team plays the service time game and should do so.This is a year to see how players like Peraza perform at the big league level so get him up here and lets see what he’s got.The service time is just math play him and then send him down before you lose a year of control.Players know the drill and in my opinion Peraza ought to be playing this year and Phillips should be on the bench.Let stop pretending we are going to compete this year and see what we have for next year and beyond. DeJesus, JR. can take over 2nd. base while Phillips is out. Peraza should stay at Louisville where he is improving his walk ratio and decreasing strikeouts. Then he could be called up late in the second half of the season and be ready to take over second or shortstop in 2017. As many have said above, I say call him up and let him play awhile, then send him down whenever is necessary to stay under a year of control. Let him get some more major league experience and provide some versatility off the bench when he’s not starting. The service time rule rule is archaic !!!! I understand the intent, but it is very unfair to the player. 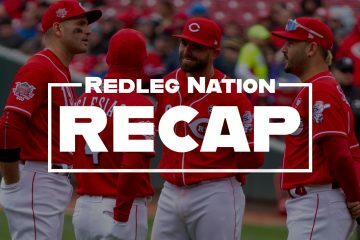 Because the Reds are not good this year; Reed, Stevenson, Peraza are not on the club now.